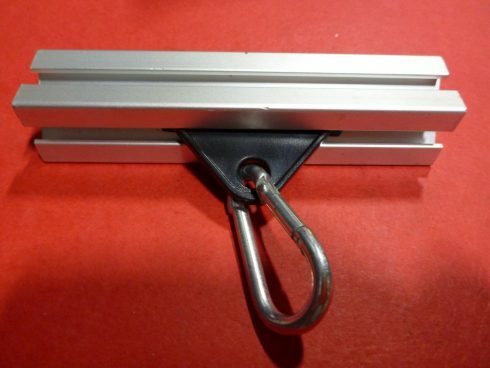 Black Nylon Tool Hanger w/snap hook GREAT DEAL!! This ad is for one assembly of Hanger and Spring Snap Hook. The TH-010 Hangers will fit in the 10 or 20 Series extrusions and can be loaded from the ends only. The TH-015 Hangers will fit in the 15 or 40 Series extrusions, and are also compatible with the 45 Series Extrusions. They can only be loaded from the ends. Ideal for installing pneumatic tools, making sliding doors, or cable carriers, AND it comes with the Snap Hook. Fully compatible with practically any T-Slotted Extrusion.